I am only now starting to realise how much I know about dieting and nutrition. Since hubby went on a dieting bender three years ago I have been accumulating- willingly or not- a lot of information about dieting. It happened mostly because I did the cooking and the portioning (at some point he lived for entire months on microscopical 100g portions of lean meat and wholegrain rice !!). Then when we travelled to see his family I noticed his brother eating an equally strict but slightly more varied diet, including “good” fats like peanut butter, tahini and fruit. Needless to say they were both the beaux of the beach wherever we went and got all the attention but many times I wondered at what cost. Well, I got my answer this weekend when hubby had what I called a “48-hour body shut down.” He had felt tired and slightly run down for a month with a couple of bouts of cold but then we attributed it to work stress. What I never expected was for my Duracell-rabbit-kind-of-a-hubby to go into complete exhaustion mode and lie in bed for almost a full weekend!! He’s better now but I still think he needs to see a doctor and get some blood tests. I suspect a massive lack of iron and other essential minerals due to his extreme dieting in the last few years. But then I thought, wait a minute! I went from snacking on toast and pancakes basically all week around to snacking on things like hummus and celery. It could not be the best solution(and in time I might consider replacing hummus with other dips if I see any alteration to my appetite) but I have made a step towards better eating. I try to have as many veggies and fruit as I can, I try to integrate healthy oils into my diet and I am being a better example for my three-year old.Well, you know what, for the moment, that is good enough for me!! I know for a fact that overdoing it is as bad to your body as not doing it at all. This is day 5, there are only 35 days left of this challenge! Whatever you do, enjoy the small steps you take towards a better you!! P.S. – I should put a photo of the two beaux to delight your eyes with but I haven’t asked for their permission, so, sorry, it’s again, salad pics ;-). 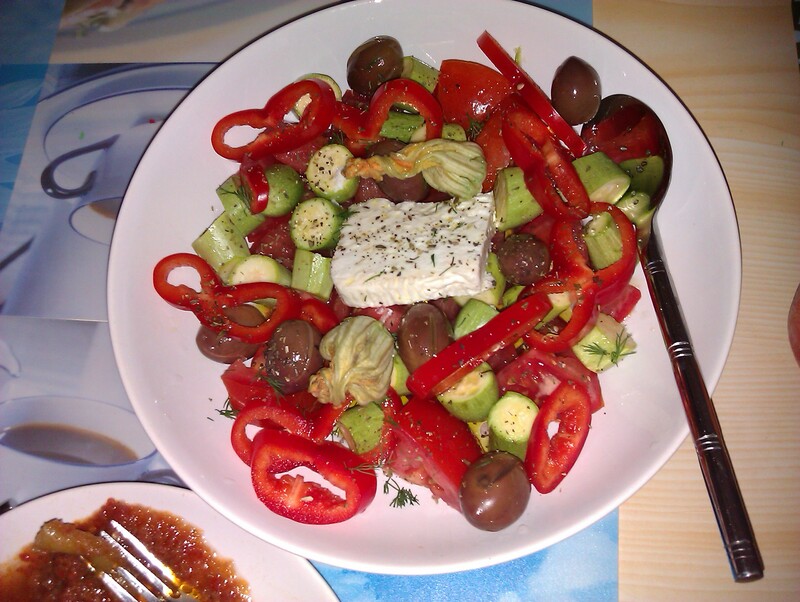 Craving a real Greek salad tonight with veggies fresh from the market! Summer, hurry up! I think Maria works with a lot of people with serious health problems and her advice was probably for people with various issues. Still, as you say, I find a diet without pulses and beans quite extreme. Take the carbohydrates out and what’s left?? Incearca fasolea rosie in locul celei albe, ca are un indice glicemic mai mic! Succes in continuare! Te pup! Aaaa,mersi frumos Gabi, chiar nu stiam!! Tipa asta de care scriam ieri recomanda scoaterea din dieta complet a fasolelor din pricina insulinei produse dar nu prea sint doritoare pentru ca nu stiu cu ce ar ramine dieta mea. Deja nu maninc piine, dulciuri. Daca scot si astea imi ramin doar legumele si carnea :-).